The sound of earth crashing into water echoes between the banks of the river. Local guide Karill Serotetto from Yar-Sale is badly hurt. While indicating how much the permafrost has retreated along the banks of the Yuribey, a small car sized chunk of the river wall collapses. Rescuing him from underneath the mound of earth, it becomes obvious that urgent medical attention is required. But this is the Tundra, any hope of rescue is a long way off. Russian voices shouting instructions over the sounds of boat engines starting. ”We must find a chum , tribes carry medical supplies in case of emergencies while herding,” comes the translation. After agonising hours speeding along the river signs of a settlement finally appear. As soon as the engines cut, Karill is carried off for an urgent shot of morphine and hidden under the reindeer fur shelter of a chum. The next day brings news that Karill is recovering and the tribe are his relatives who are about to migrate. They are heading north over the Yuribey in search of new pasture for their herd of over 2,000 state owned reindeer. The migration over the river is only possible at certain points of the year as the water level rises with the summer melt. 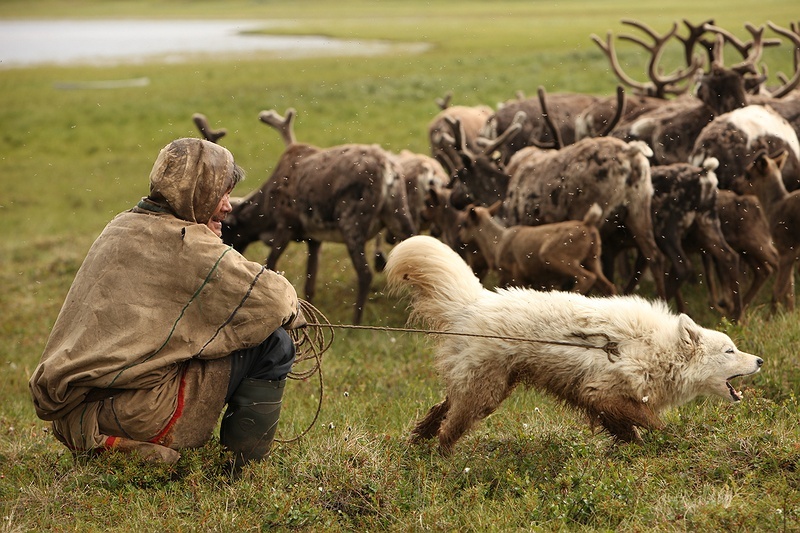 Migrating on the peninsula is becoming trickier for the herders as the climate gets warmer. The Ob is the fifth (according to most sources) longest river in the World, cutting through the bottom of the Yamal Peninsula. Crossing it while frozen is essential to move between summer and winter pastures. Quick spring melt and refreezing leaves unstable thin ice that reindeer can't cross giving rise to food shortages and overgrazing. Snow thawing and refreezing causes more problems creating an impenetrable layer of solid ice preventing reindeer from reaching lichens they feed on under the snow. During recent years their pasture area has decreased and the landscape has become increasingly unpredictable and dangerous as the permafrost melts. In Yamal there are two kinds of herder, a split caused by 1960's Soviet Russia when herds were collectivized under the communist Soviet Agricultural System. The herders in Yamal worked on fixed contracts and salary, becoming part of the soviet economy farming meat to supply the country. The respectful symbiotic relationship of the traditional Nenets culture was missed by the Soviet state. The Nenets consider themselves bound into a relationship with the deer where safety from predators is exchanged for clothing, transport and housing. Now herds on the Yamal Peninsula range from small private herds of 100 to the largest 8th Brigade herd of 7,000 on the Yar-Sale state farm. Whether the Nenets can retain the nomadic traditions of their ancestors will be determined by the exploitation of resources and climate change. Both are impacting the landscape and prevent the ability to migrate freely echoing that the drive for fossil fuels is changing the world and our ability to live in it. Their nomadic way of life with reindeer has a history longer than a millennia and the Nenets are the only remaining Nomadic herders left in the world. We may not be able to empathise with their loss of sustainable culture but we should heed their warning that the landscape they depend on and know so intimately is changing .